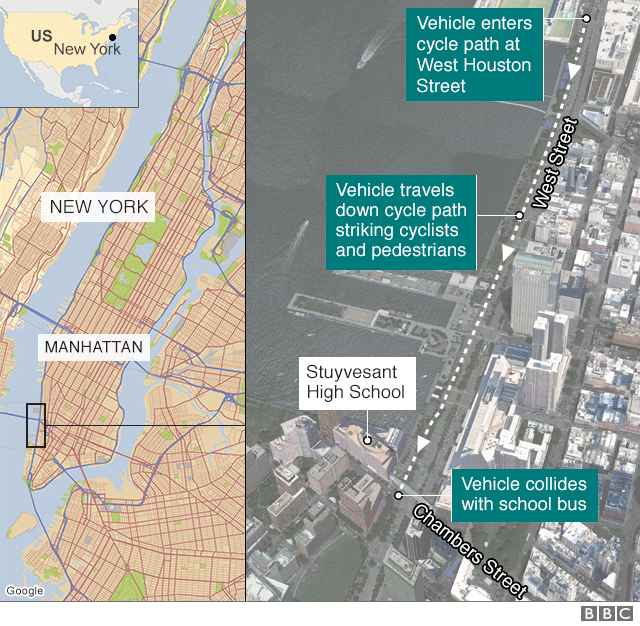 At least eight people have been killed and 11 seriously hurt in New York after the driver of a truck mowed down people on a cycle path in Lower Manhattan. A 29-year-old man who emerged from the white pick-up truck was shot by a police officer and arrested. Officials later said it was a terror attack. 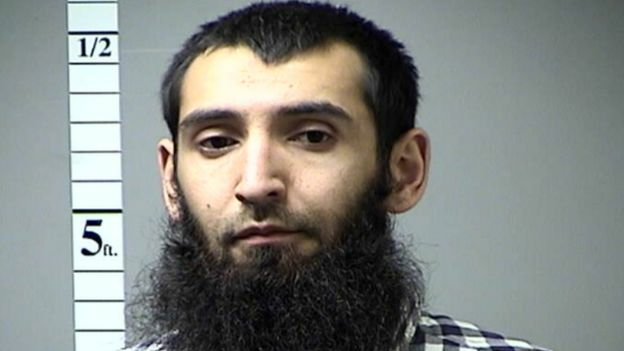 Media named him as Sayfullo Saipov, an immigrant who came to the US in 2010. A note was found in the truck that referred to so-called Islamic State, a law enforcement source told CBS News. The suspect – who had apparently settled in Florida – was taken to hospital. New York City Mayor Bill de Blasio said it was a “cowardly act of terror aimed at innocent civilians”. New York Police Department (NYPD) Commissioner James O’Neill said the injured had “serious but non-life threatening injuries”. “The dead and injured were just going about their days, heading home from work or from school or enjoying the afternoon sun on their bicycles,” the commissioner said. Mangled bicycles littered the scene of the attack, which occurred as much of the city was celebrating Halloween. 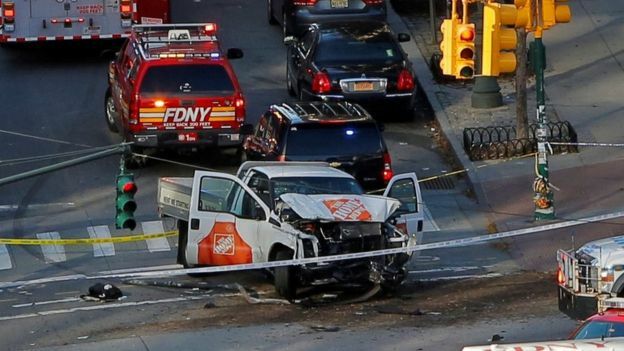 One witness, identified as Eugene, told ABC Channel 7 that he saw the white pick-up truck driving fast down the cycle path alongside the West Side Highway, near Stuyvesant High School, at full speed and hitting a number of people. He also reported hearing about nine or 10 shots. Another witness, who gave his name as Frank, told local TV network NY1 that he had seen a man running around an intersection and heard five to six gunshots. President Donald Trump had been briefed on the incident, the White House said. At the moment the New York authorities are saying that it was a lone wolf, that the attack wasn’t part of a wider conspiracy or plot. But this is an active crime scene at the moment and they are still trying to piece together precisely what happened. The attack happened on Halloween, one of the most festive days in the New York calendar. The pavements were crowded with kids in costumes and there are still children trick-or-treating just yards away – it’s a bizarre scene. But it shows how New York absorbs this kind of thing. We are just yards from Ground Zero, a site which reminds all New Yorkers of that awful day back in 2001. It didn’t take police long to confirm that the city had once again been the target of terror. My problem with Islam is that I just don’t know the really one, Isis claims they are the real deal, the moderates claim same. Who is the real Muslim? so we can says its ok or its not. An organised war on terror in particular has prepared the ground for the formation of terrorist organisations in the Muslim world, and especially in the countries of the Middle East. It is alleged that some terrorist organisations are supported by various state departments in the countries where they operate; this is done so that such groups can be used against other terrorist groups. In this regard, the existence and formation of such organisations are offshoots of various “conspiracy theories” yet, there is still much that is unclear concerning this issue. Jihad as struggle pertains to the difficulty and complexity of living a good life; struggling against the evil in oneself – to be virtuous and moral, making a serious effort to do good and to help to reform society. Pamameen, that is a very good definition of what jihad is and what it should not be.